Donations cheerfully accepted to help provide free paper toys to children all over the world. 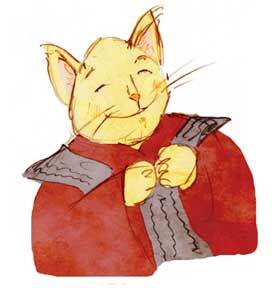 The Toymakers met a very kind elderly cat who showed them how to make paper koi kites. 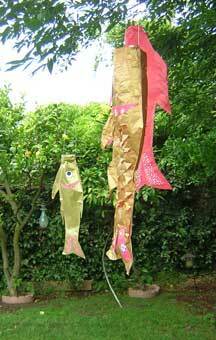 These fish kites are easy to make and look beautiful hanging in the wind. Trace the pattern twice on plain or fancy wrapping paper. Glue the two halves together along the edge. 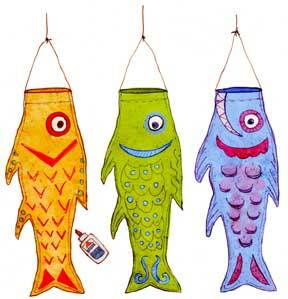 Decorate with cutout scales, paint or glitter, don't forget the eyes! I like to use two layers of paper and make V cuts in the top layer for scales, fold up the V tips so that underlayer peaks through. Make a ring to fit in the mouth by folding a piece of 8 1/2 x 11 paper in half long ways and then fold again. Tape the ends together to make an "O" shape. Glue the "O" inside the fish's mouth. 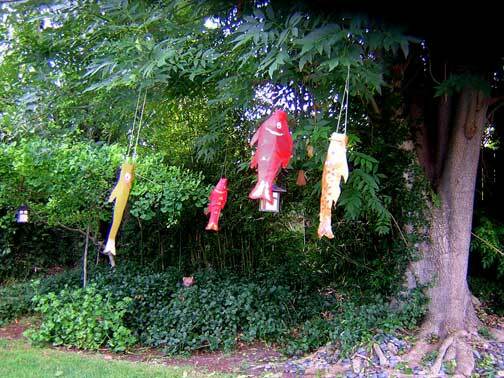 Punch holes for thread and hang from a pole or tree. Fill out your e-mail address to receive my free Toymaker's newsletter and learn when new paper toys are posted.